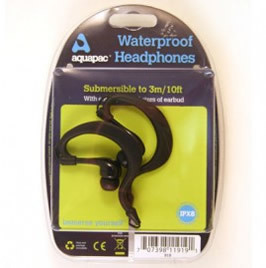 AquaPac Waterproof Headphones For Swimming Swimmer Ltd.
Waterproof headphones from Aquapac that fit all standard MP3 player audio jacks & cases. 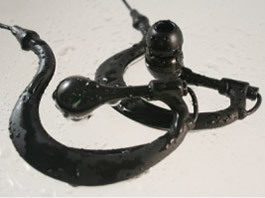 Designed to work with most iPod, iPhone or other waterproof MP3 cases with a standard 3.5mm headphone socket. These Aquapac waterproof headphones come with a set of three changeable mushroom style silicon earplugs of different sizes to fit different ear canal sizes. These waterproof headphones are great for swimming as they stay firmly put in your ear canal due to the earclips.The earclip has a swivel feature for best fit and comfort. Each pair comes with 3 different sizes of silicone earbud to make sure they fit your ear canals. Now fitted with silicone earloops to keep them firmly in place. Frequency response: 19Hz - 20KHz. Impedance: 32 Ohms. Audio Pressure Level: 100db (1kHz/1Vrms). Although tested waterproof to 30ft (10m) you should not use them at greater depths where the pressure could cause hearing damage. Recommended for use with Aquapac waterproof MP3 case. These Aquapac waterproof headphones are both cheaper and better than H2O waterproof earphones. Comfortable, Compact, Durable, Good Bass, Lightweight, Rich Sound. Yes, I would recommend this to a friend. Great for swimming in the pool. -Gary, Florida, USA. I sweat a lot when I work out and these headphones are highly sweat resistant. I did a lot of research to find these waterproof headphones and these ones are the highly rated because they manage to have great sound whilst being waterproof. I also listen to music in the Jacuzzi after working out and I pair these with my Aquapac waterproof iPod case. Great Product. Great bass sound. - James, North Carolina, USA.